If you are not failing, you're not trying. The problem is not failure. Failures are absolutely necessary in order to make progress. No one succeeds all the time without failing. In healthy organizations and churches failures at attempting great things are celebrated and welcomed. In stagnant and dying organizations and churches everyone is afraid of failing. As a result no new lessons are learned, nothing new is tried, no progress is made. The key is learning from failures. The key is to not repeat and duplicate the same failures multiple times. You want to keep failing forward until you get better at moving the purposes of God further down the road. 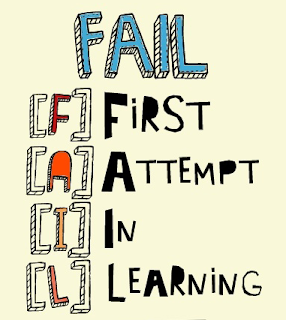 Leaders, it is crucial that you create an environment where people are encouraged to FAIL - make First Attempts In Learning. Encourage people to strive after excellence and greatness. Help your church and organization move the purposes of God.